There has been much debate on the topic of making mens cosmetics more masculine. There seems to be the same clear brief across all advertising campaigns around the country. 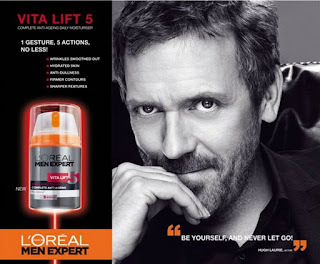 Just take the new L'Oreal advertising campaign for men as a prime example - fronting the L'Oreal Paris Expert For Men range is the rugged bad boy actor, Hugh Laurie. It seems even a global superpower of beauty products has turned its back on the pretty boy in favour of the rugged 'real man'. If you want further proof then take a look at the advertising campaign for Montagne Jeunesse’s new face packs for men. Featuring five separate masks to give skin a deep clean, tackle blackheads, perk up morning-after skin, rescue tired eyes and deal with blemishes, the masks have been ‘put through their paces’ by the Cardiff Blues rugby team. If it's good enough for Gavin Henson then it must pass the test, right? This might come as a surprise to many of you, especially when considering just how brutal a sport rugby can be - not what you would usually associate with beauty products, but ironically, of all sports, rugby always comes across as the most metrosexual one, as well as the most manly. Players are a part of such a masculine sport that it matters little how they choose to groom themselves off the pitch. We've seen semi-masculine advertising campaigns in the past from Gillette featuring sports stars such as David Beckham, Thierry Henry and Roger Federer - heavily featured in the razor blade adverts, but rugby players and face masks is certainly something new which pushes the boundaries of masculinity to the very edge. Can you imagine what the reaction would be if a top flight football team was part of the same campaign?